The following responses come from alternative rockers The ReAktion. This Chile-based quartet will be performing at the Cleveland Agora with Otep on June 11th. 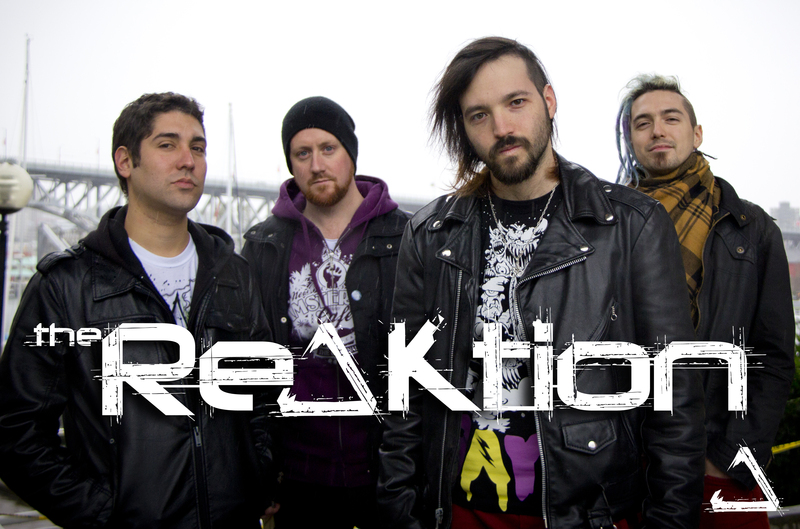 The ReAktion formed back in 2010 and is known for their blend of rock, metal, and electronic genres. You can track their tour leading up to the Cleveland date on their travel blog here. In the meantime, learn more about the band from their responses and check out their lyric video for “10 Steps to Success” below. Three words we’d use to describe us are….Awakening, Consiousness, Revolution. The story/meaning behind our name The ReAktion….starts when we all quit a bunch of other side projects we all had and decided we needed to do this for real, we needed something simple, something powerful that everyone could reflect into. In the beggining we where actually “The Reaction”, but our friend Futcher suggested we change the “C” to “K”. He’s the man. The most OCD member is….Diego as well lol. But seriously, he’s always been very obsessive on what he’s interested on. That has come in very handy on many occasions. For fun we like to…. Wake-n-bake, go hiking, play music, comics, movies, cook. Pretty average stuff. Oh, and Simon likes to fly little airplanes. And Leo likes to build stuff, really awesome and smart things too. He built all the furniture in our rehearsal room back in Chile! We find inspiration from….good food, good friends, family, good spots, good grass, meditation. There’s people that inspire us a lot in what we do and what we want to express, people like John Lennon, Alex Grey, Naomi Klein, Ghandi, David Icke, Kurt Cobain, Carlos Castaneda, David Parserisa, Dave Grohl, Residente. All people that had real fire in their lives and on what they did. One thing we want you to remember while listening to our music is….that there is a message in our lyrics, in the frequencies we use, in the chords that make up our songs that are all intended to bring positive things to the world. The first song we wrote together was….a song called “The Worst is Coming”, recorded for our demo LP. We defined lots of the changes and the future of our sound on that song. You could call that ground 0 for us. Our craziest or most memorable gig was….our show at Fuga on 2014, a huge festival we started with only local bands and artists in Chile from all different styles and types of music and that we are doing again this year! Something odd we want our fans to know about us is….one of us was abducted once. We can’t tell you who though. We’re absolutely terrified of….nothing. Fear = Hate, and we decided to vibrate in other frequencies. Our last meals would be….anything, as long as we are surrounded by the people we love. Hopefully something with avocado though. We all love avocado. In the next six months you should expect….new tour dates, new videos, and the release of our new album Selknam. This entry was posted in Fill In The Blank, Interviews and tagged band interview, chile, electonic music, electronic, fill in the blank interview, fill in the blanks, interview, metal, rise of the runaways, rock, rock music, The ReAktion, the reaktion music. Bookmark the permalink.